HCM City (VNA) – Chairman of the People’s Committee of Ho Chi Minh City Nguyen Thanh Phong on August 22 received Politburo member, Chief of the Lao People’s Revolutionary Party (LPRP) Central Committee’s Office Khamphanh Phommathat who has been on a working visit to Vietnam. Welcoming the LPRP Central Committee’s Office delegation, Phong said the visit will help boost cooperation between HCM City and Lao cities and provinces. 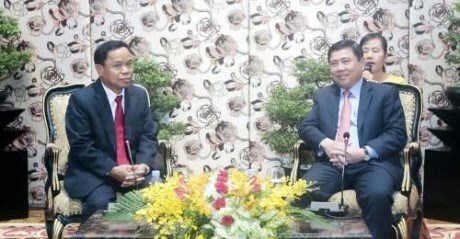 The city has carried out a wide range of cooperation and friendship activities with Lao localities, thus deepening relations between Vietnam and Laos, he said, adding that celebrations have been held in the city to mark the 55th anniversary of Vietnam-Laos diplomatic ties (September 5) and 40 years since the signing of the Vietnam-Laos Treaty of Amity and Cooperation (July 18). The events have contributed to the enhancement of mutual understanding and friendship between the people of HCM City and Laos, the chairman noted. For his part, Phommathat informed Phong of the results of his working visit to Vietnam, especially the successful talks between the Offices of the Central Committees of the LPRP and the Communist Party of Vietnam.